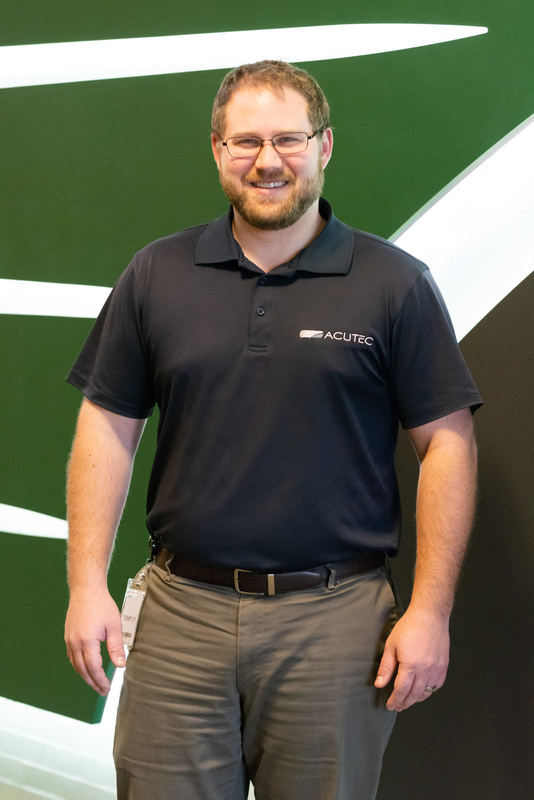 Employee Spotlight – Zach Smith | Acutec Precision Aerospace, Inc.
Manufacturing on our scale requires that we always keep track of our progress. As our Financial Controller, Zach oversees our finances and helps to guide our decision-making as a company. How long have you worked here? I’ve been an employee for fifteen years. When you were an intern what kind of tasks did you do? With the co-op program I worked in various departments. I started in the Saw Department getting material racks organized and documented. From there I worked in Shipping, NDT, Secondary, Inspection, Tool Room, Tumbler Room, Maintenance, and ran several different CNC lathes. I interned in the accounting department for six months, where I handled many different analytical projects and learned the reoccurring tasks of payroll, deposits, and check runs. What was your education path? I graduated from Edinboro University in 2004 with a degree in Forensic Accounting. I later earned my master’s in business administration from Penn State Behrend. How did you hear about Acutec? In high school I took advantage of Crawford County’s Vo-Tech program and went through the Machining and Tool and Die program. Through that program I found Acutec was hiring co-op students, so I applied. What makes you stay? The first reason would be loyalty and pride in the company. Acutec gave me my chance, worked with me as I got my bachelor’s degree, sent me to get my MBA, and have offered me fantastic benefits. There is also something to be said for watching the company grow and knowing you have a hand in that. Acutec is a team that likes to win. You see that every day here. We always help each other out, regardless of whether or not it involves our department. We all share a common goal to be the best at anything we do. I also appreciate the challenge. Everything from “We’ve never seen this before. How do we do it?” to “How can we do this task better?”. To remain the best at what you do, you must constantly adapt and change, and Acutec gives everyone that power to explore that. If you have an idea, suggest it and we can explore it. What is advice you would give to students just coming out school? Always be curious and never stop learning. College gives you a great foundation, but I gained just as much knowledge (if not more) from listening and working with others and always wanting to know how things work. What is the most important thing you learned here as an intern? How to think outside the box. What are some things you do outside of work? I spend time with family, hunt, fish, and golf. Learn more about our ASCEND internship program to see how you can grow your career like Zach.